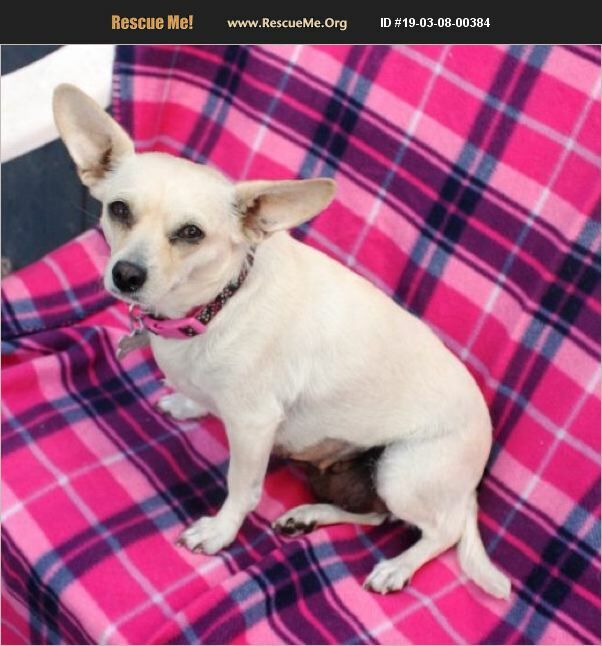 Juniper is a precious 11 month old Chihuahua mix who deserves a home just as special as herself. She weighs 14.5 pounds and is full grown. Juniper came to the rescue at the beginning of January and was very pregnant! The very next day when she was just only supposed to be getting an ultrasound, she started delivering her pups right in the vets office. Juniper had 6 healthy pups who are now all available for adoption just like their mom. With the help of one of our amazing fosters, Juniper and her six pups got to be in a nice relaxing home to feel comfortable and safe in while the puppies grew up. Juniper is shy at first but warms up in no time! She is very sweet and loves affection from men, women and gentle children. She does well with dogs of all sizes and once comfortable she has a playful spirit! Juniper will need a patient home that understands she may need training as she adjusts into her new home. She is spayed, up to date on vaccines, microchipped, and vet checked. Her adoption fee is $300 and comes with 30 days of free pet insurance, and comes with a free vet visit. Come to our location at 1102 W. Hatcher Road in Phoenix 85021, open Tues-Sunday 11am to 6pm. On weekends, give us a call for the dogs location as we have off site adoption events that some of our dogs attend, 602-944-2440.